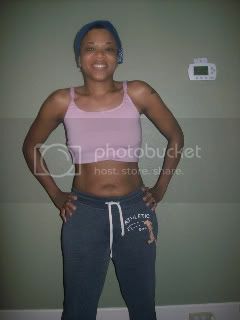 We completed the Insanity 60-day workout program! Just in time too because I wrenched my left knee when I landed wrong during a power jump. Hopefully, it will be fine in a few days. We did the final Fit Test yesterday. I cannot believe how far we've come! I am proud of myself for sticking with it. I feel great and I look better than I have in months. I am stronger and firmer as in my inner thighs no longer slap together when I do a jumping jack. I still see more work to be done, but that's not me nitpicking. I won't stop until my abs are back to their original flatness. I did this for me, but also for my daughter. One of my motivations is to model the importance of fitness for her. She is a fast learner, too. She loves to exercise and say "dig deep!" Tomorrow we start our 3-day juicing cleanse. I will post about that too with before and after pictures. Thanks to everyone who has followed my Insanity blog posts and cheered me on! You look sooo much slimmer! Although I thought you looked good when you started. Congrats to you! Guess there are times when insanity is a good thing. You are a total inspiration! I just bought Insanity and am excited to start!! As someone who just finished what advice do you have?? I am so scared! LOL!! You look amazing!! Mind me asking how many inches and such you lost? Also, now that you are done what will you move onto??? And what is the juicing cleanse? Is that part of the program??? Thanks for any advice you might have! Yahooo! You did it and it shows! I hope your knee gets better soon. I've BTDT with knees and it is not fun. You look great mama! I'm so proud of you. I'm thinking about doing it, but am a little scared. Maybe I'll see if the husband will do it with me. Now go get your t-shirt. Monday I start month 2!!!! You are so inspiring I can see a HUGE different in your hips and waist and shoulders. Wow, that's wonderful how you completed that!